This year, I suddenly found myself free over the summer half term. 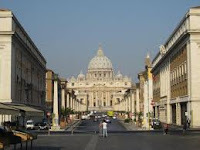 Not particularly enamoured with the idea of staying in the UK to celebrate the Queen's Jubilee (nothing personal, you understand...) I jumped at the chance of a trip to Rome. I don't know why, but I half-expected it to fall through at the last minute, so I haven't really allowed myself to think about it too much. I've also been rather busy with work stuff. So I'm now almost deliriously happy to realise that, in two days' time, I shall be jetting off to the Eternal City. I do intend to take lots and lots of photos. Blogging, however, might be even more sporadic than usual.